The West Hollywood Heights Neighborhood Association is conducting a survey to learn the impact of the installation of “bulb-outs” and a “parklet” along Sunset Boulevard. The installation is part of the City of West Hollywood’s Sunset Experience program, a six-month pilot effort to improve pedestrian experience along Sunset. 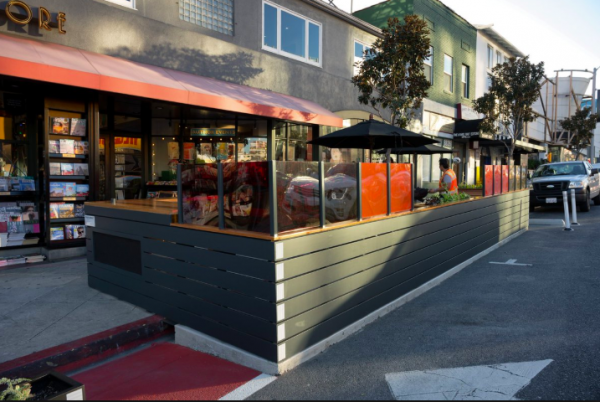 It includes bulb-outs, which are white poles and black planters at intersections along Sunset Blvd from Sherbourne to San Vicente and along Holloway to Palm, and a parklet, which provides seating for pedestrians, in front of Book Soup. “Many residents have requested this program end early as it has negatively impacted traffic flow, damaged cars and we believe the value to pedestrians is overstated,” says an email from WHHNA. The survey can be accessed at https://www.surveymonkey.com/r/WeHoHeightsSidewalkBulboutsSurvey . The City of West Hollywood also is collecting feedback about the Sunset Experience on its website. The link to the city survey is posted at www.weho.org/sunsetexperience and the direct link is www.surveymonkey.com/r/MNCXLS9. More information about the Sunset Experience program can be found on the city’s website. Gimmicks are no substitute for thoughtful and sound engineering of the circumstances. After the consultants have cashed their checks, they are not responsible for the outcome.